Recently, Russia's communications regulator Roskomnadzor started to enforce a proposed block on LinkedIn after a court ruling found the social network guilty of violating a data storage law. LinkedIn has approximately 6 million Russian users and it has become the first major social network to be blocked in the country. 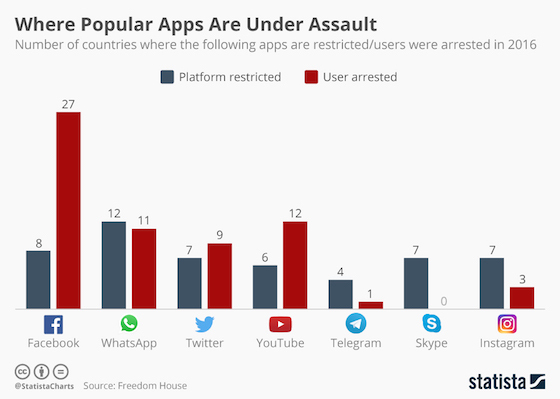 The chart above shows the number of countries where apps are restricted/users were arrested in 2016. Internet & Social Media: "Where Social Media is Under Assault"